Nobody here wants to hear this BUT - this need to be put in perspective - all this discussion and energy spent over supplemental feed may be interesting but it is such a small part of what it takes to grow trophy deer on a low fence ranch. When put into context, genetics, habitat, management, and age are the real contributors to producing high end trophy bucks. Feed is such a small portion of the equation. In dry years it does have some impact - in wet years it truthfully is not the factor in horn growth. If you are selling feed or or believe it makes all the difference then fine - but the reality is no matter how good a feed is it really has a small overall impact on what a LF ranch will produce. Any legitimate biologist will tell you the same. Last edited by TKK; 05-04-2016 at 08:29 PM. Nobody here wants to hear this BUT - all this discussion and energy spent over supplemental feed may be interesting but it is such a small part of what it takes to grow trophy deer on a low fence ranch. When put into context, genetics, habitat, management, and age are the real contributors to producing high end trophy bucks. Feed is such a small portion of the equation. In dry years it does have some impact - in wet years it truthfully is not the factor in horn growth. If you are selling feed or or believe it makes all the difference then fine - but the reality is no matter how good a feed is it really has a small overall impact on what a LF ranch will produce. Any legitimate biologist will tell you the same. I agree with your statment that many elements go into growing big deer, but will also add that high fenced ranches require the same elements. Sound management practices are very much required regardless of the fence height. Last edited by TKK; 05-04-2016 at 08:11 PM. I've got age and habitat I'm just working on management and learning all I can about feed. Genetics I obviously can't change LF but I see it as best to get the best nutrition as soon as you can, then if you see the "plateaus" in growth you know it's all you could do. Yeah..... $42.95 a bag for Max Energy AM here.... WOZERS!!! They also eat twice as much of it and grow an additional 50" of bone. Well worth the $$$ !! I have never met you. I am as B&C said earlier in the thread, not a sales representative just another satisfied customer. I haven't posted here much except during these feed discussions. I like to stay out on the sidelines and watch. I will tell you I have seen some really nice jumps in antler mass and body weights on our lease since I started feeding DD. I do believe DD is a special feed that has improved above other brands that are still building the same old feed. I have seen the results and watched deer progress on the Holden pasture over the years as many on here have. Mr. H would not be feeding it if he wasn't satisfied. He has an extremely high passion for big Whitetail Deer. I have seen him watch deer I would have considered management deer becoming deer of a lifetime on the other site. That ranch shows results and I enjoy watching. That ranch has been a huge inspiration to me. Jason and I commend you, DF&G and your marketing structure. Seeing all the photos and videos your marketing guys do have really changed things for many hunters including my self. I enjoy seeing instead of hearing about how things are being done. The Double Down Facebook is really nice please keep it going as usual it's very informative not to mention the great photos! You are making the best deer feed available and its is a tough road to travel being at the top. I hope to get a chance to meet you in person Saturday I will be dropping by your store on my way to the ranch. Thank you for stepping in on the feed conversation it's been a long time coming and very educational. be nice if I could find some of these other then MG and antler maxx local to me. So could give some of them a try. Thank you for the kind words. Happy to hear your great results on our DD feed. We feel that we have developed and brought to the market place a top notch product. I'm all for exchanging information and sharing our thoughts when it comes to deer protein. We have been producing such products since 1981 right here in Dilley. Please drop by for a cup of coffee on Saturday. Yes I do believe he believes in the feed, but also when he owns the trademark for the feed he has a financial gain from it. Without the Holden Ranch and Mr. H, we wouldn't be having this discussion as the teaming up with him and showing pics made it what it is. Think about it....would you be all over the internet repping a product, posting before/after photos, and spending all day promoting it if you had a full time job and got no deal on feed or money from it? Last edited by gingib; 05-05-2016 at 08:46 AM. Well..... this post have got my hamster wheel spinning at mock speed. Picked up the protein today for the next feeder fill. It's weeks away, but excited about the TDN and seeing what happens. 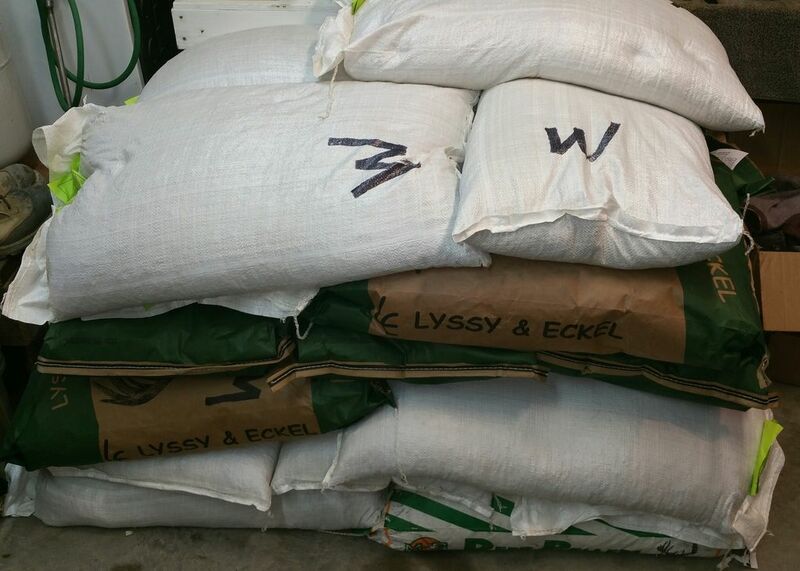 Alternating bags upon filling it will contain 50-50 Lyssy & Eckel mixed with Double Down. This should give a combo of protein sources with some.of the highest TDN available. Gonna keep that mix up thru this anther growth season as well as next (about next 18 months) and document the results as I go along. We shall see what happens. Wish me luck! What "results" are you going to document? Just photo game camera pics to see of there is a noticeable difference in antlers, body mass, or fawn numbers, size. Nothing scientific really. More of anything that will make me feel justified in my efforts and keep me moving forward in the same direction. you won't notice a difference this year or next....its a long term project. You have to understand the difference in hunting and feding the Trans-Pecos desert. There is VERY LITTLE food out there and very low deer densities. The first year we began feeding we went from seeing 5 deer a day to 20-30 deer a day and could already see difference in health and antlers. I understand the long term goals and effects, but this is like building a grocery store in the middle in a remote desert village..... Makes a lot larger impact that starting a feeding program were there is already ample natural food sources. We shall see what the game camera and hunts show over the next 18 months. DF&G where are you? A response to the mans post seems appropriate. Seems like a legitimate question. Sorry we are freaking slammed here at the feed mill in Dilley. We have never denied that Brett's team has assisted us in marketing this feed. I'll tell you that any benefits that Brett realizes are not open for discussion. This thread is about the best supplemental proteins on the market. I've been totally up front with all involved and more than willing to share information. The knowledge received and traded back and forth here is exactly what I've hoped it would be. Bottom line if Brett didn't think it was the best supplemental feed on the market he wouldn't touch it. Listen, we have done our research on all the feeds offered. We developed this feed four years ago and it flat out works. [QUOTE=DF&G;11311508]Sorry we are freaking slammed here at the feed mill in Dilley. Last edited by TKK; 05-06-2016 at 09:35 PM. If you want to turn this into some sort of personal vendetta that's fine. I'm on here to talk deer feed and its evolution. Simple enough. Back to topic: Any other feeds that ween need to track down TDN's on to add to the list??? This thread makes me wonder what the TDN is of elgato feed is. Or how does it compare to the others, sense his is a custom blend. My apologies I intended to say it is not worth a response. I have no beef with you personally or the feed that you sell. My issue simply is the way It is promoted. This thread is very interesting. So is TDN the end all be all when looking at protein feed? We feed Record Rack 20% and have been pretty happy with it, but we are always looking for a better quality feed that's somewhat close to our property. Is there a DD dealer close to Brady, TX? The closest dealer we have to Brady is Fredricksburg, which isn't too close. If you have any suggestions or contacts in or around the Brady area please PM me and I'll be happy to see what I can do. I'd really like to get a central Texas dealer on board. I was able to confirm with Double Down, Bee County Co-op, and Lyssey and Eckel (the top 3 on the list) that neither of them adjust their recipes at all....working on finding out from the other feed companies. This thread is very interesting. So is TDN the end all be all when looking at protein feed? This is the big ? I would say no, otherwise we would've heard about it a long time ago. If I were L&E and had a higher TDN than Antlermax or even Record Rack I certainly would've pushed that subject in my marketing. Wouldn't have you?! I would say no, otherwise we would've heard about it a long time ago. If I were L&E and had a higher TDN than Antlermax or even Record Rack I certainly would've pushed that subject in my marketing. Wouldn't you?! I think in LF supplemental feeding it is not a huge deal.....if inside a breeding pen or HF with little natural browse it would be a bigger deal. End all be all? No but still an important number I would think. I was told my local mill NEg (net energy for gain) is more important but it looks like that kinda goes along with higher TDN seeing lab samples. You still want your minerals and stuff right for your place also. If this stuff matters for cattle you would assume it would matter in deer if you're that serious about your supplemental feeding program. I remember when the protein % was all that mattered to people, then minerals, then vitamins, now possibly this being a decision maker. As people learn more and more they demand more. Any One Know The TDN for Cottonseed? During the cotton seed pressing process the gossypol levels drop to such negligible levels it should not cause concerns ruminant feeds. Much like how soybeans are processed and handled. This is the conclusion of the article. The ingestion of gossypol present in cottonseed and its products (cakes and meal) may promote clinical poisoning, liver damage, male and female reproductive toxicity, and immunological impairment. The acute poisoning is not currently a significant problem but the reproductive damage causes serious economic losses to the livestock industry. Even though the male reproductive toxicity is well known, there is a need for more studies to understand the female reproductive damage promoted by gossypol. The immunotoxicity of gossypol is far from being completely elucidated, but it impacts animals by reducing their resistance to infections and by impairing the efficiency of vaccines. Extensive research is needed to develop more efficient and inexpensive technologies to reduce gossypol toxicity. Isn't the whole issue with gossypol only if a deer eats a high % of his diet in cottonseed? From the studies I have read, a free range buck/doe will not eat a high enough % of their diet in cottonseed. Therefore, they don't see the effects of gossypol. The articles I am speaking of are from Caesar Kleberg. That's almost exactly what the article reads. Gossypol is an issue in Whole Cottonseed. Always has been and always will be. When it is processed into cottonseed meal, almost all the oil is removed. During this process, gossypol is transformed from "free" to "bound". Bound gossypol or d-gossypol is considered to be inactive in feed ingredients. Furthermore, the heat process and diluting of cottonseed meal with other ingredients in a pellet form make it non existent. As for it's concentration in whole cottonseed, it is hard to detect. You could hold out two handfuls and one would contain 12,000 parts and the other 0. But the supplement nutritional value is a risk many deer hunters are willing to take. You are correct. Most of these studies, like the one quoted above, are directed to dairy cattle. Im just trying to ask questions that are important points in feeding deer. You read a lot of scientific articles about deer feed products that say what can happen if presented in diet. Cattle feeders will not feed it to there bulls. If it only affects the reproduction by 1/3 then if a buck only breeds 3 does in one breeding season( free range low or high fence) then you might only impregnate 1-2 does. So you might not be replacing the herd like you think you are. I'm already building my stack of DD and L&E for the next trip west to fill feeders. Gonna mix it 50-50. 2 high quality feeds with separate protein sources and vitamin contents should cover the spectrum and provide all that I can give to the deer out there. That just might be the ticket Cody. Can't wait to see the results. 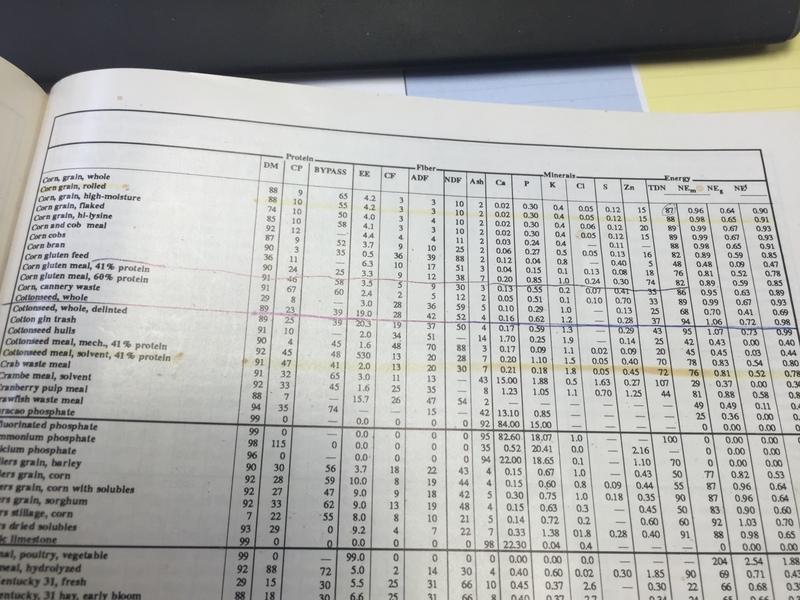 I know very little about the science behind feeding deer supplemental protein, but I compare it to workout diets for strength and size gains which I did for years. In years passed, guys would eat tuna from daylight to dark and made great gains, but when that trend began to fade and they ate tuna, chicken, eggs, and beef they found that they made quicker and better gains. The reason was different protein sources which digested at different rates and offered a wider range of vitamins, minerals, and amino acids. This may be a 100% apples to oranges comparison and have ZERO relationship to deer protein, but it makes sense in my head and I figure with both DD & L&E (which are both avaialble here locally) I can offer the widest range of high quality protein and vitamin content. To our knowledge none of our customers have ran into a issue with cottonseed regardless of the form. The cattle industry has been utilizing all components of the cotton plant from whole cottonseed to cottonseed meal to gin trash and burrs for ages.